Summer is in it’s prime and the markets brimming with fresh produce, it’s the perfect time to make a fruit-filled dessert. While I love a good French Apple Tart, Orange Cake, or a Red Grape Olive Oil Cake, when produce is at it’s peak I love taking fresh fruit and making it the star of the dish. I know you’ve heard that we eat with our eyes first. Anyone who loves to eat (like I do!) knows it’s true. 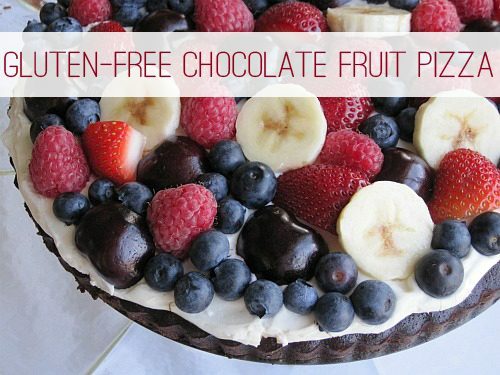 This simple gluten-free chocolate fruit pizza is too beautiful to resist. Too often, I hear people apologize for serving gluten-free food to people who don’t need to eat a specific diet. Or, people who aren’t gluten-free don’t want to eat food that doesn’t contain gluten as if there’s something wrong with it. My philosophy is that good food is good food, regardless of what’s not in it. You can serve this dessert with no need to apologize or explain. It’s just good food. Because the fruit and the sweet cream cheese layer are naturally gluten-free, the brownie ‘crust’ is the only part that of this dessert that requires gluten-free ingredients. For those of you who aren’t gluten-free, use any brownie recipe you’d like. When it comes to choosing organic fruit, I always consult the Dirty Dozen and Clean Fifteen, which tells you what produce has the highest levels of pesticides. Download this free printable to take with you on your next shopping trip. fruit of choice – I used bananas, cherries, blueberries, raspberries, and strawberries. Preheat oven to 325 degrees F. Prepare a 9-inch tart pan with oil. Put the butter, oil, and chopped chocolate in a microwave safe bowl. Heat for 30 seconds and stir. Heat for another 30 seconds and stir until chocolate is melted. Mix together coconut palm sugar, eggs, vanilla, and instant decaf. Once chocolate has cooled slightly, stir egg mix into chocolate. Sift Pamela’s Baking & Pancake Mix on top of chocolate mix. Dump any of the flour mix left in the sifter into the bowl. Fold into chocolate mix. Turn into the prepared pan, spread evenly, and tap a few times on the counter. Bake for 20 - 23 minutes or until brownies are set in the middle. Brownies are fudgier when slightly underbaked. Let cool completely before proceeding. Beat the cream cheese until light. Add the honey to taste, vanilla extract, and salt and beat until combined. Spread on top of the brownies. Cover the cream cheese completely with your fruit of choice. If you use bananas, dip them in fresh-squeezed lemon juice to keep them from turning brown. Lay any juicy, cut fruit such as pitted cherry halves on paper towels to drain. This keeps the juice from running all over your cream cheese. What’s your favorite way to use fruit in dessert? 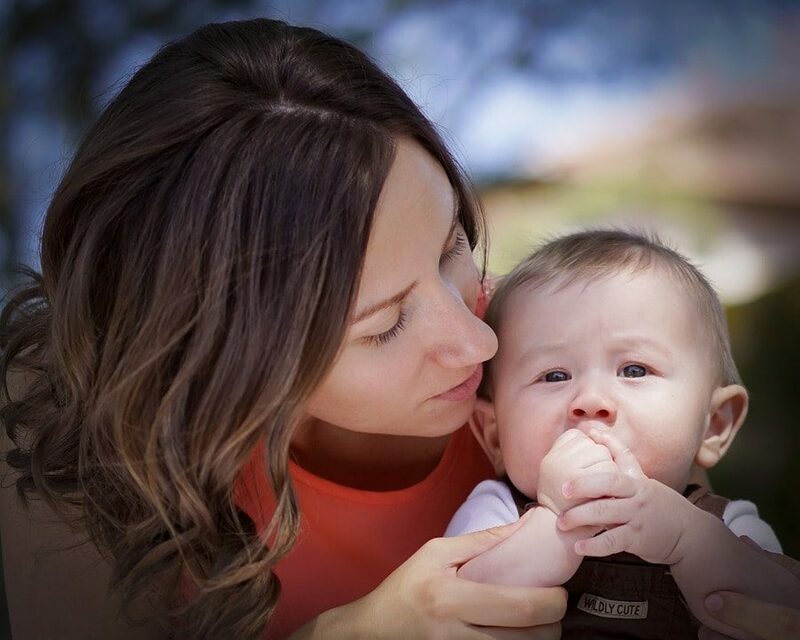 A stay-at-home mom, wife, and passionate cook, Amy strives to make each meal healthy and delicious. When she’s not doing laundry, dishes, or caring for her son, she plays around with food in the kitchen developing new recipes, which she shares at Simply Sugar & Gluten-Free. Amy also publishes The Balanced Platter and authored the book Simply Sugar & Gluten-Free: 180 Easy & Delicious Recipes You Can Make in 20 Minutes or Less.